Charles-Augustin de Coulomb was born in 1736 was a French scientist who immortalized his name to honor the power units for important research that has been done by these scientists. Coulomb comes from an influential noble family to education is guaranteed. He is talented in the areas of mathematics and learn techniques to become the Kingdom of Engineer Corps. 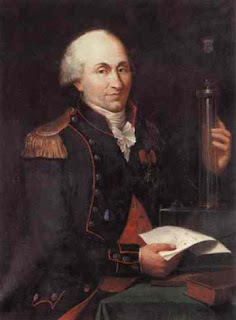 Having served in Martinique for several years, he returned to Paris and in 1779 was elected to the Academy of Sciences in 1781. He died in 1806. At the time of the French Revolution broke out, he was forced to leave Paris with a friend living in Blois are also scientists, Jean-Charles de Borda (1733-1799). He continued many experiments and finally was appointed school inspector in 1802. Initial experiments include the Coulomb pressure can break an object (1773) and this was the beginning of modern science about the power of objects. His work in the field of electricity and magnetism that makes it so famous, newly published in a series of papers between 1785 and 1789.
discovery Twist Scales, to weigh things very lightly. Coulomb torque Scales had brought to the discovery of the most important. By moving the two electrically charged spheres near a torsional balance, he showed that the strength of the two objects is different if both the object apart. He studied the effect of friction on the machines and display theory of lubrication. All this, together with his views on the magnet, published in Theory of Simple Machines in 1779. From 1784 to 1789, while working in various government departments, he continues to investigate electrostatics and magnetism. Coulomb's Law came out in 1785; attraction and electrical repulsion between two electrically charged objects is the charge multiplication with the inverse square of the distance. This formula is very similar to Newton's law of gravity. At Blois, Coulomb studied the electrical charges on the objects and the discovery that the charge is only on the surface of the object. Obtainment also that magnetism also follows the inverse square law as static electricity. Some of his works are found also by Henry Cavendish Cavendish but the new work published in 1879. Coulomb discovery that ensures the relationship between electricity and magnetism was later proved by Hans Christian rsted and Simon Poisson. And this is the basis for the study of electrodynamics by Andre-Marie Ampere. All his work shows originality and thorough research and diligent.